Films – A Comical Interlude … for some! Have you ever thought about killing your boss? Then this film for you because you can laugh and say that is my boss. And this is exactly what they try to do, taking advice from Mr MF Jones (Jamie Fox). What happens when they decide to snoop in each others’ bosses houses to get the information they need to create the perfect M-U-R-D-E-R? The three men are hiliariously funny. 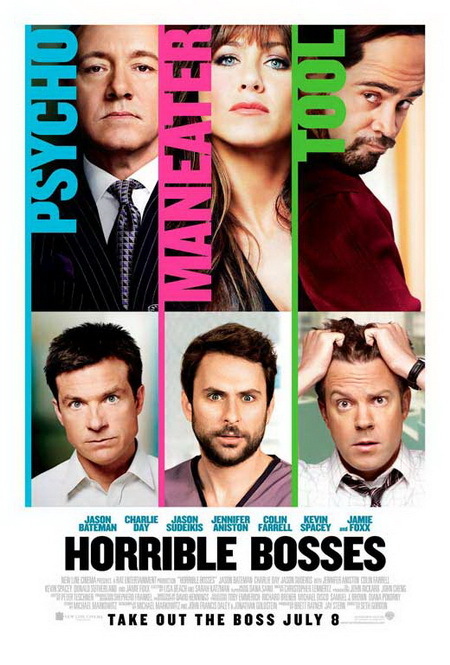 There is Nick Hendricks (Jason Bateman) whose boss is Dave Harken (Kevin Spacey); he is the psycho-boss. Dr Julia Harris (Jennifer Aniston), who is a maneater, is the boos of Dale Arbus (Charlie Day). Then there is Kurt Buckman (Jason Sudeikis) – his boss is Bobby Pellit (Colin Farrell); he is the tool. This is one of the few films where I have laughed all the way through. Having a horrible boss is a typical scenario for most people which makes it easy for everyone to relate to it. The Screenwriters, Micheal Markowitz and John Francis Daley, create three of the most common bosses that drive people crazy but in a film of course, it’s easy to find it hysterically funny. I would recommend it to adults and teenagers. It shows how in life you can either be lucky and have the nicest boss OR you can be unlucky and either have a psycho, a maneater or a tool for a boss!